Happy holidays from our family to yours! 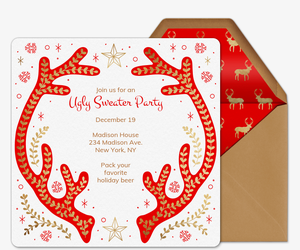 Get your family and friends in the holiday spirit with Evite’s new free and Premium online invitations for any winter occasion. Our holiday invitation collection features more than 100 handcrafted designs for Christmas, Hanukkah, Kwanzaa, and New Year’s, as well as general designs for the winter season. Planning your party around a specific theme or activity? 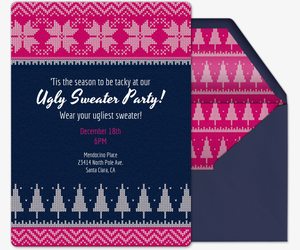 Our gallery has invitations for ugly sweater parties, cookie decorating and baking parties, gift-wrapping parties, winter wonderlands, holiday bridal showers, holiday birthday parties, and more. 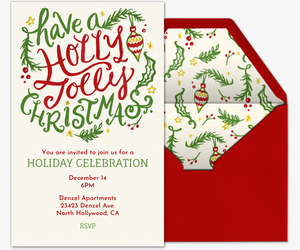 Whether you’re hosting a house party, office party, or a charitable event, digital invitations make holiday hosting easy. Manage your guest list, track RSVPs, send messages, post comments, and more, all via your paperless invitation. Then, collect guest photos after the event is over by telling guests to upload pictures to your event’s private social feed -- and use them for personalized thank you notes! 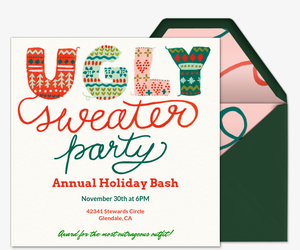 Give your holiday event an upscale feel with our Premium digital invitations. Evite’s Premium invitations are ad-free, look and feel just like printed invitations, and come with extra features, such as envelopes, stamps, and photo and text cards. Pricing is based on the size of your guest list. Stress less this holiday with expert tips from Evite Party Ideas. Get inspired by our helpful guides for open house parties, baking parties, corporate parties, movie nights, and more. Plus, check out our holiday entertaining shortcuts and interactive menu calculator for stress-free and budget-friendly tips! Planning for a different holiday or occasion? Browse our Christmas invitations, Holiday for Kids invitations, Hanukkah invitations, Kwanzaa invitations, New Year’s Eve invitations, and more. You can also plan birthday parties, baby showers, engagement parties, and other milestones.